No more. Today’s US government spends however much it wants. It cuts taxes by however much it wants. It spends exactly no time wondering where the money will come from or wondering how long this wild level of debt spending can possibly continue. At the very least, it’s refreshing to not have politicians blowing perpetual hot air about how concerned they are about debt levels while continuing to engage in policy that increases those debt levels. This is not a partisan issue, either; guess how far you have to go back to find a president who decreased America’s federal debt burden? Vermont’s own Calvin Coolidge. Who left office in 1929. But truly and willfully detaching from reality vis a vis debt spending, wholly embracing a “What? Me worry?” attitude toward affixing rocket boosters to deficit spending, has all the earmarks of final nails being pounded into a currency’s coffin. Given that it’s too late to save the dollar anyway, perhaps we should applaud the audacity with which the dollar is being diluted into oblivion. If you know your Ponzi scheme is going to collapse but few enough people have caught on that you can still scam new investors, why do so with any restraint whatsoever? Get all you can, as fast as you can, and fiddle away while the first few flames are sighted in Rome. America is in the midst of its greatest crisis in its 242 years of existence. I say this based upon the US federal debt to GDP (gross domestic product) ratio. 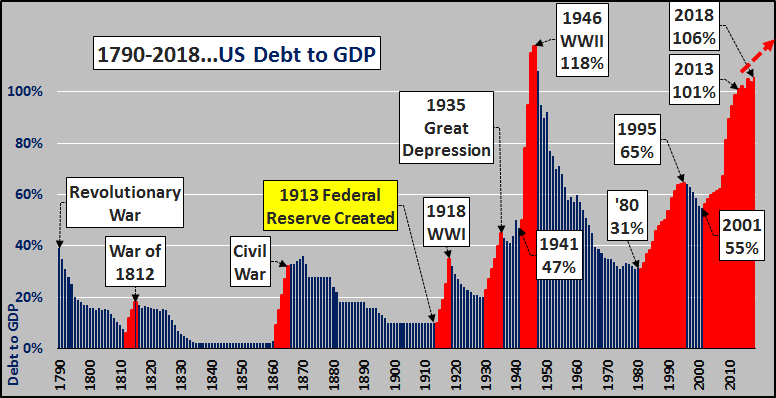 In the history of the US, at the onset of every war or crisis, a period of federal deficit spending ensued (red bars in graph) to overcome the challenge but at the "challenges" end, a period of federal austerity ensued. Until now. No doubt the current financial crisis ended by 2013 (based on employment, asset values, etc.) but federal spending continues to significantly outpace tax revenues...resulting in a continually rising debt to GDP ratio. We are well past the point where we have typically began repairing the nation's balance sheet and maintaining the credibility of the currency. However, all indications from the CBO and current administration make it clear that debt to GDP will continue to rise. If the American economy were as strong as claimed, this is the time that federal deficit spending would cease alongside the Fed's interest rate hikes. Instead, surging deficit spending is taking place alongside interest rate hikes, another first for America.